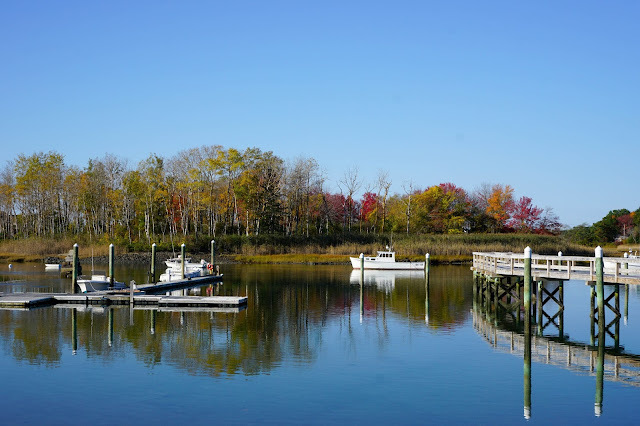 Recently we made a trip up to Kennebunkport, Maine to enjoy a fall weekend getaway. Located about thirty minutes south of Portland, Kennebunkport is just a short trip from Boston. Upon our arrival Friday night, we had dinner at The Burleigh. Both the atmosphere and food were amazing. From there, we went to check into our room. We stayed at the Cape Arundel Inn at one of the Rockbound Bungalows. Our room were located just a few hundred yards from the ocean and featured amazing sunrises with oceanfront views. The room was spacious with a gas fireplace, patio and huge bathroom. The daily breakfast was the perfect way to start our day. We fueled up on some delicious food while watching the wave crash against the rocks. During the morning we went for a walk down Ocean Road where the hotel is located. The road runs right along the ocean and offers beautiful sites of the main coastline including former President, George Bush's Summer home.